Week 10 was a rest week. I definitely rested. I probably had too much rest. I totally blew off the whole weekend. I justified it in my mind because my daughter was sick and I could feel some congestion in my chest and figured I should hold off on the exercise. The thing is the congestion comes and goes, and for most of the weekend I felt just fine. So I missed my weekly long bike ride and actually gained two pounds, but that is all the more reason to just get back into the game! So this week I am going to come back strong. 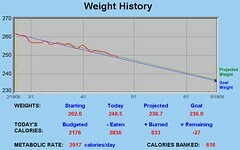 But before I go into that I figured I would discuss some real measurement of progress. The first is my weight. I am down past 250! 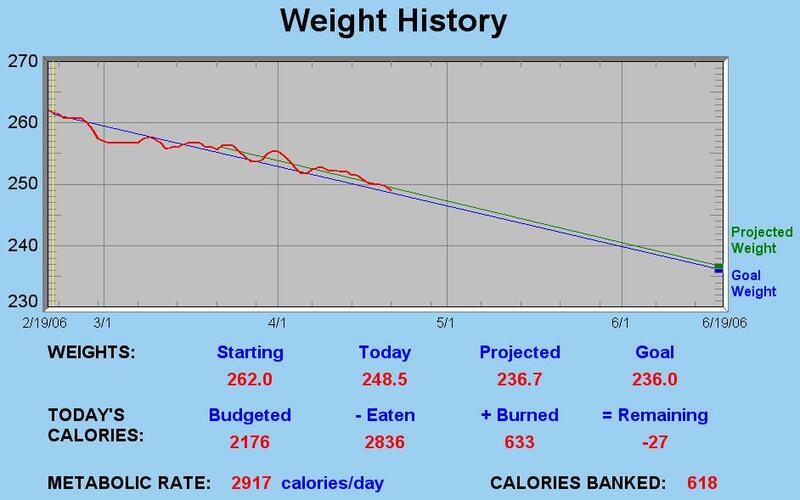 Here is a chart that shows my progress so far. I smoothed out the data a bit to make the graph more legible, but still the line follows the goal line quite closely. It is pretty amazing actually. The second sign of progress is my projected VO2 Max. My heart rate monitor has a "fitness test" that measures basic data and projects VO2 Max, which is basically a measurement of how efficient your body is in converting oxygen into energy. The test is really easy, and basically involves lying down and getting a measurement. My projected VO2 Max is 34, which still is considered "poor" but is on the high end of poor rather than where I started, which was 29, the low end of "poor." That is a whole 5 points of improvement! Lastly, my run is getting faster. That's right; I'm actually becoming a speed demon. Ok, maybe not. I'm still really slow, but there has been definite improvement. Here is a chart of my long runs over the last month. Each time I ran for over an hour. You can see that my heart rate this morning was the same as the run I did back in March 25, but I am a whole .7 mph faster. Awesome! You can also see from the chart that on the weeks where I did not run faster, at least my heart rate was slower, meaning that I could go the same speed with less exertion. I love these numbers. This is the beauty of a heart rate monitor that gives you plenty of data and allows you to download it to a computer. I had not realized that I was making that kind of progress until I looked closely at the numbers. Wednesday: Swam 1450 meters, 45 minutes. Thursday: Spinning class 60 minutes, I actually pushed a little too much here. I did all the out of the saddle work the teacher was pushing and my heart rate probably got a little too high. Friday: Swam 1800 meters, 45 minutes. The posts have been few and far between, and that is because my internet connection is down at home. For the next couple weeks it will be a bit sparce, but will still be training!